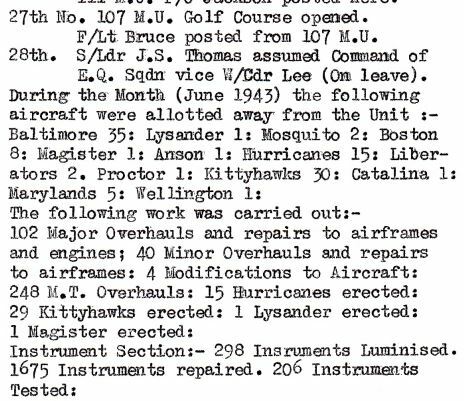 107 MU GOLF COURSE WAS OPENED DURING WW2 PER THE FOLLOWING EXTRACT FROM 107 MU OPERATIONS DURING JUNE AND APPEARING IN A COPY OF THE KASFAREET KRONICLES. 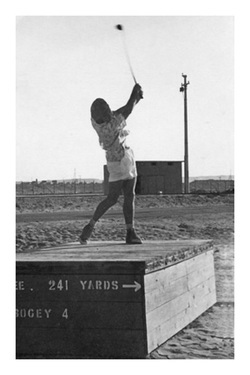 Dec 16th 2010...Jack had forwarded me the picture of the Golf Clubhouse ` under construction July 1953 `. This picture had been kindly sent to him by Vincent Lyons who was another Exiles CC man and is still very active with cycling for his local club. This is now supplemented by the first two pictures displayed, supplied by Frank Petter showing the Golf Clubhouse in construction at an earlier stage in 1952. It may well be that the topping out stretched from 1952 into 1953. Jack then referred to a couple of Colin Harrington`s pics taken in 1955. He says, " when I first looked at Colin`s pic of the 1st Tee with the club in the background, I thought that the club house building was not the club I remembered. I have vivid memory of the occasion when, after completing a fourball match with other PSCO lads, we were challenged to a four-a-side indoor hockey match...using (I think five or eight irons and a Dunlop Warwick golf ball !!!) Although the Golf Club was not all that big, I can see now from Vincent`s picture that it was long enough for our " illegitimate encounter ". I cannot recall who won the match but I do know that there were sore and bruised legs....but more importantly a lot of wreckage to the furniture and one broken window..
Fortunately the guy who was the acting Bar Steward was not there and true to RAF tradition we did not hang around for too long after the event but not before we had left a few ackers in the pot to pay for our orange cordial and water. A return match was never arranged ! Wal Hilsden`s response to this message was .....Jack, I must say that the Clubhouse looks quite large and I thought the windows were bigger than that. I never helped build the Clubhouse but I did help construct the Course and it`s design. The hard work was done by the East Africa Pioneer Corps guys and we supervised their efforts in constructing greens and bunkers. The greens were built up of a finer sand treated with Diesel Fuel and you will recall when we played the tournaments their was a wog on each green with a square cocoanut matting that he towed around the green working outwards from the pin to ensure that the next players through had a virgin surface to play on. I nearly got myself decapitated one day by a 7 ft tall Sambo when I was giving him shite about being lazy when working on one of the greens. He said " C`mon no good Baas " and had a swing at me with his long handled shovel ! ps - If you have looked at The 112 Sqn in WW2 Page under Kas Files B, you will note that I have referred to a book of fiction called ` To Play the Fox ` by Frank Barnard concerning the air war in the Western Desert. I say fictional ( but based on many facts ) and the author`s account of the Takoradi Run commences with the comment that " (At Takoradi)......in the hut closest to the nine - hole golf course with it`s greens of sand...."
The Takoradi golf course then possibly pre-dates the Kasfareet course.